What is the most voted up and voted down question and answer on Stack Overflow? What's the most voted up question and answer in Stack Overflow history? And what is the most voted down question and answer in Stack Overflow history? 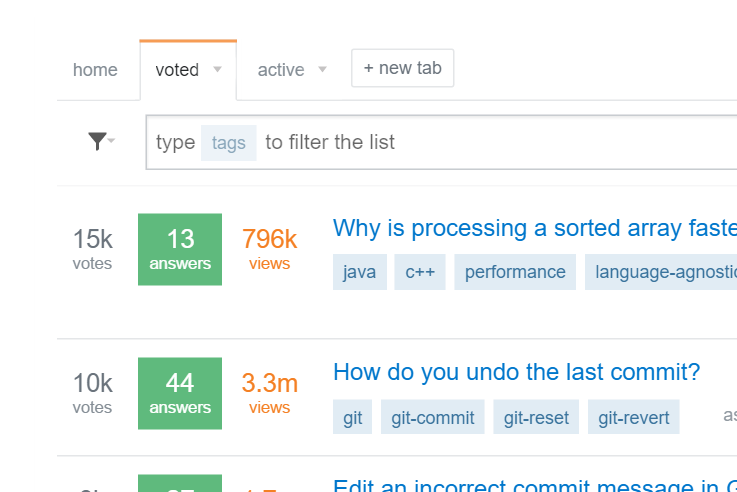 The most upvoted question is Why is it faster to process a sorted array than an unsorted array? (14632 votes), and it can be found by searching for is:q and sorting by votes. The most downvoted question, (i.e. with the lowest score) is currently Forcing a function to return if false, and an honorable mention goes to How to send 100,000 emails weekly?, which was previously the lowest score question. Both are at ~ -150 votes. These can be found by again searching for is:q and sorting by votes, and going to the last page of the results. For answers, you can similarly search for is:a and sort by votes, and go to the last page for the most downvoted ones. Currently, the highest scoring answer is Mystical's answer to Why is processing a sorted array faster than an unsorted array?, currently with a score of 20368. The most downvoted answers are this one ("I solved the problem by dropping the table and restoring it from backup. "), and this one to Google Play on Android 4.0 emulator, which basically says "Don't do this". (It's also the accepted answer). Both are currently at -58. What is the most voted thing on Stack Overflow, and how many votes does it have? How can I know who has voted down my question? What kind of questions belong on Stack Exchange and Stack Overflow? How can I list the most voted questions every day? Why is this heavily downvoted question not yet removed from Meta Stack Overflow? What is Stack Overflow Meta and how is it different from Stack Exchange and Stack overflow?